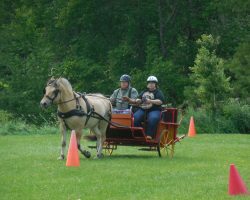 For those students who may not meet the criteria of the Riding Program, we also offer carriage driving through our Driving Program. 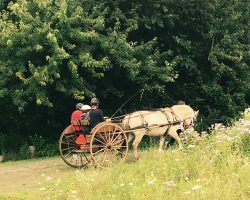 Carriage driving is an excellent way to teach confidence, independence, and communication. It can also help with balance, strength and coordination. 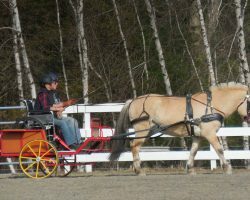 During a driving lesson, a PATH International Instructor will aid the student in learning the skills needed to drive a horse. 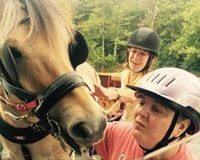 These skills include learning to harness, the proper use of the reins and how to communicate with your voice. Driving provides a great opportunity to understand how our horses communicate with us. 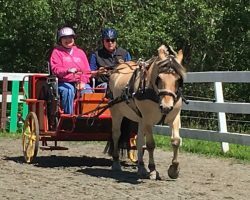 Our Driving Program is appropriate for students of all abilities, even those in wheelchairs as we have a specially adapted carriage that is wheelchair accessible! To download the entire Adult Application Form, please click here.